So how old are computers? And what were the original computers designed for? Sure... we all know about the rapid development of modern computers in the 20th and now 21st century. And - frankly - we both know if you have a computer that's anything over five years old, then you probably think of it as being "ancient." But let’s step back a wee bit further in time, shall we? In fact... let’s step back - to say - over 2000 years ago and to the lands of ancient Greece. That's because it's here, in ancient Greece, we discover that the very first ancient ancestor of the modern computer was invented. This ancient ancestor of the modern computer was an astronomical mechanism designed to locate the zodiacal positions of the Sun, the Moon, and the five planets (Mercury, Venus, Mars, Jupiter, and Saturn). Yep! The ancient ancestor of your modern computer was a Greek device - now called the Antikythera Mechanism - designed for the specialized purpose of casting astrological horoscopes. How do we know about this ancient astrologer's tool, you might rightly ask? Well... according to Dr. John H. Lienhard, PhD Professor Emeritus of Mechanical Engineering and History at the University of Houston, in 1900, six Greek sponge divers and their crew were much by chance blown off course in the Mediterranean between the islands of Kythera and Crete. Dropping anchor by the tiny Aegean island, Antikythera, these sponge divers decided to make the most of their misfortune and dove into the unfamiliar waters of Antikythera to see if they could find any sponges. What they found, however, was a badly decomposed ancient trading ship that had sunk around 80 BC. According to Lienhard, due to this being the first ancient wreck ever discovered, the Greek government soon after sent the sponge divers back on an official navy ship. Diving 140 feet down for a solid year, the divers brought up statues, amphoras, and various other trade goods. It appears that one of their most fascinating finds may have been a 2000-year-old computer, now dubbed “The Antikythera Mechanism.” The mechanism was comprised of a badly corroded set of brass gears, encased in a wooden frame about the size of a shoebox. Unfortunately, in 1900, not knowing how to properly preserve ancient wood, the frame collapsed and broke apart. Over half a century later, in 1958, a young British physicist and historian of science, Derek Price, became interested in studying this ancient device and came to what could be considered some startling conclusions. Derek Price wrote in the Scientific American in 1959 what was thought by many to be a monumental study of the time. Price identified this device as being from circa 80 BC. And while much of the original gearing was obviously missing, there was enough left to show that the device had likely been intended to provide the motions of the Moon and Sun. “The mechanism is like a great astronomical clock without an escapement, or like a modern analogue computer which uses mechanical parts to save tedious calculation. It is a pity that we have no way of knowing whether the device was turned automatically or by hand. But this, also, is not where the story ends... while there has apparently been more than a little scuttlebutt in the scientific community over Price’s alleged fudging with data, there has now been a totally new analysis performed by Michael Wright, the Curator of Mechanical Engineering at the Science Museum in London, utilizing tomography. In his more recent analysis, Wright believes that the device was much more sophisticated than Price ever thought or imagined. While Price appeared to be on the right track, rather than a front dial with Sun and Moon pointers, Wright feels certain that he has discovered a much more elaborate front dial. It's a front dial that transforms the face of the mechanism into a complete planetarium with eight pointers. So the first ancient ancestor of the computer was a Greek astronomical mechanism designed to locate the zodiacal positions of the Sun, the Moon, and the five planets (Mercury, Venus, Mars, Jupiter, and Saturn). According to Phillip Ball - Nature 454, 561 (July 31, 2008) - recent discoveries point to the possibility that the Antikythera device may have even timetabled the ancient Olympic Games. There is now speculation (based on newly discovered inscriptions on the device) potentially linking its invention to Archimedes (287 BC – 212 BC) a Greek mathematician, engineer, and astronomer (astrologer). Knowing all this... the debate nevertheless still continues on. 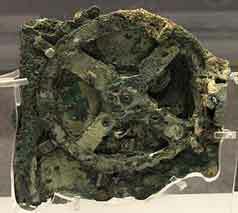 Was the Antikythera Mechanism merely a "play toy" for the rich? Or was it a practical device used by astrologers of the time to cast ancient horoscope charts?